This has been an irregular blogging week in my life due to the absence of my Main Squeeze. I’m astounded (and reminded again to be thankful) by how much my writing career is only possible at this stage of life (with young children) because of my husband’s support. I write this blog in the nights and early mornings (and I use my daily time of childcare to work on book promotion). So this week without my husband to do dishes or put kids to sleep while I work has made my time to post on the blog challenging. The good news is…JoJo (my mom) arrived on Wednesday to rescue me from my loneliness! And we spent all day yesterday shopping in the suburbs. I didn’t write one bit! Sometimes shopping at Target is good for my soul. I got new cozy pants. I feel better now. The other good news? Chris comes home tonight. Seven days is a long time without him. So my little homestead is very excited. So many of you wonderful people have sent me photos of you and your copy of my book, which showed up this week if you pre-ordered it! Thanks so much for ordering one and letting me know. 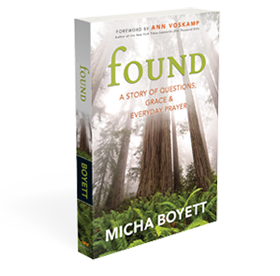 If you’re still on the fence about the book, I’d love to point you toward Diana Trautwein’s lovely review of Found this week on her blog. What an honor. We’re still tagging our Instagram photos with #FoundGrace. It’s been such a sweet thing to see the ways our little community is meeting God and God is meeting us. Will you think about joining us? It’s not too late. Found will not be released everywhere else until April 1, but you can go get your copy from Amazon right now and you’ll receive it before it shows up in stores! I’m off to play some catch up. Happy Friday, friends.